Working on any kind of a research project has never been easy; however, dissertation writing is one of the most demanding academic writing forms that require a lot of research, analysis and time. Preparing a dissertation discussion is even harder as you have to analyze works of other scholars as well. Let us begin with the definition of dissertation discussion. This chapter of the dissertation that is supposed to provide an examination of your finding in terms of previously available knowledge base, as well present any new insight into the problem. A discussion chapter shall address such questions as unique approach to the problem (comparing from what was previously described in scientific literature). Encourages the reader to critically evaluate the information you present in your research. Explanation of results. Deliberate on the fact whether the results received comply with what was predicted before the research. Note any patterns or trend you have found. Links to previous research. Compare the results you received to those from the similar research project, note the difference and highlight those that are important to your research. Deduction. The broad explanation of possible implication of the results you have, possible recommendations for further research and improvement of existing practices. Hypothesis. A possible conclusion that can be drawn from your results. Alternative explanation of the results. Sometimes, if you stumble upon some results that were not initially predicted, you may need to provide some sort of explanation for it. How Long Should a Dissertation Discussion Chapter Be? The first thing that you need to remember is that the length of each chapter is calculated based on the overall length of the work you are supposed to submit. 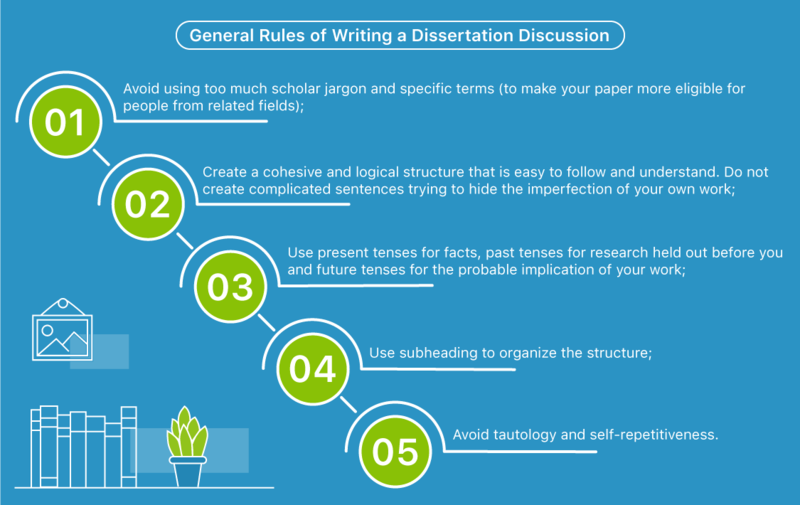 Dissertation discussion usually takes 10 percent of your paper, meaning that is you have 10 000 word dissertation, you will have to write approximately 900 to 1100 words in this section. Why would someone need professional assistance in writing a dissertation discussion chapter? First, it requires a lot of research, and unlike your Literature review section where you briefly describe all the research held, in this section, you need to thoroughly read those works that are closely related to your research and address the difference between them and your research. So you see why many students tend to turn for help from our experts. How to Order Dissertation Discussion? once the deadline is over, download your discussion from your Membership Area or receive a copy we will send to your inbox. Unlike many other online companies, we do not tolerate any form of plagiarism, so before any paper could be sent to the client, it is checked against the plagiarism using advanced software. You can even request a copy of this report to be sent with your order for free if you would like to ensure the originality of the paper received. What is more, if any plagiarism is found and proved in the paper you receive from us, you are entitled to receive a refund or get a revision free of charge. The timeframe for the free revision you can receive from PrimeEssay.org depends primarily on the number of pages requested. If you have ordered less than 20 pages of your dissertation discussion, you will have 48 hours to request a revision if needed. However, if you have ordered more than 20 pages, you are entitled to the period of 30 days of free revision. If for some reasons, you have failed to request a revision within the given period, you can add additional revision for your dissertation discussion. PrimeEssay.org believes that one of the aspects that define successful online writing agency is our ability to protect your private information. We have created a complex system that allows us to protect your identity and secure your personal information. Place your order right now and get professional assistance immediately!